Spending caps – as mentioned in the P.P.P.S. – are a good thing … poorly made though. The EU anti-deficit rules are good on paper and paper only. There are many loopholes and few if any consequences for not meeting the anti-deficit rules. So they were worthless from the beginning. Another example are the new anti-deficit provisions in the German federal and most state constitutions. Constitutions have been amended to forbid new deficits from 2020 (states) and 2016 (Feds) on (no new deficit for all of the states, Feds are allowed a maximum of .35 % of GDP per year). First you would think … wow, somebody got it right at last. Not so fast. There are a lot of loopholes: Obvious ones like those put in place to pay for the unexpected costs of natural desasters. Even many libertarians could live with that. But it doesn’t stop there. In cases of severe economic crisis (the term has not yet been determined and will likely be challenged at the Supreme Court) states and Feds are allowed to borrow whatever they think it takes to overcome the crisis. This is exactly what the EU wrote into the anti-deficit provisions that failed so obviously from the beginning. The state is too big. Redistribution too demotivating. 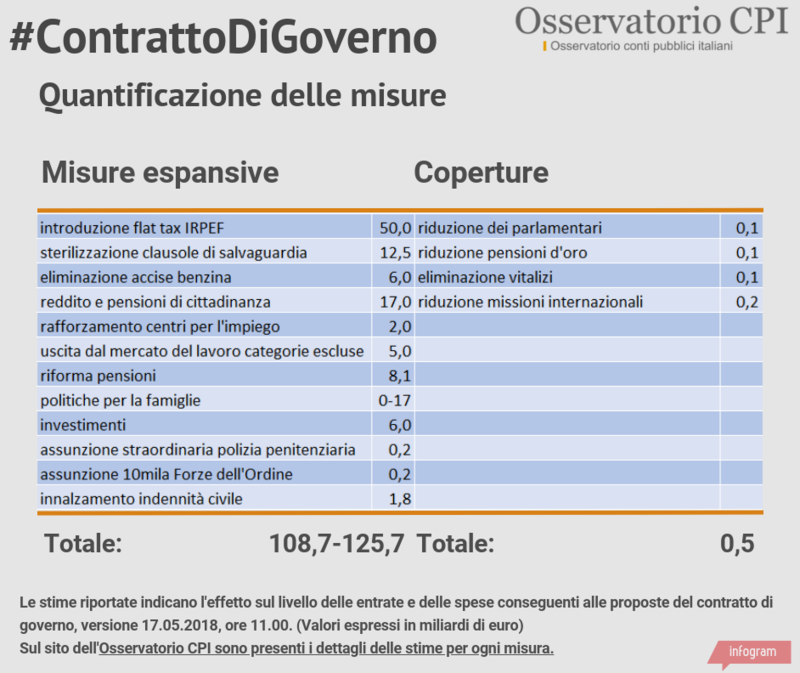 Regulation too choking; and it all got voted piece by piece by Italian voter-lemmings themselves. End result, a more demotivated Italian citizen living under a flatter effort-reward curve who cannot compete in worldwide markets. Innovation, development, production, capital, and ultimately people themselves move to more competitive jurisdictions. But the Italian voter has only himself to blame. The country of Italy — now structurally growing at less than a quarter of average annual world growth — sees its once first world prosperity being equaled by a groundswell of countries representing a much much faster compounding world average. In short, Italy is rapidly been absorbed into the new middle income country world. The Italian malaise is just an expression of that: Loss of worldwide prosperity ranking. This scenario awaits many currently advanced and smug democracies. Being drowned into middle income status by a much faster growing world average will be the rule rather than the exception for most currently smug democracies comprised of voter-lemmings. This transition and reordering of world affairs is now well underway and will complete by mid century. Very few advanced democracies will see their current smug prosperity status survive — perhaps only those with constitutional debt brakes which cannot be easily overturned by myopic voter-lemmings. PS. While Italy and Greece are further along the way, this is the essence of the general European malaise, with few exceptions. Loss of worldwide prosperity ranking. The turmoil in Europe is due to the fact that European voters sense this pervasive presence of decline and are reacting. But in typical historically established precedent they are reacting in the wrong direction. By doubling down on statism and coercive collectivism. Whether by compounding decline, whether by sudden crises, or whether by a combination of thereof, it will not end well. PPS. A rising majority of Americans are now seeing the European continent as their role model. It will not end well on this side of the Atlantic either. PPPS. For whatever is worth, I think France will also be coming up for crisis sometime in the next ten years. The much celebrated Mr Macron will attempt only twenty percent of the anti-collectivist reforms needed to make France competitive — and the heroic French people will let him implement only ten percent. France will thus continue its prosperity ranking decline in the world and the French people are likely to “revolt”. “We tried the ‘draconian’ Macron cuts and it did not work! Might as well go back to our more comfortable French ways…” the French voter will exclaim in revolutionary frustration. PPPS. The most delusional are the Germans. What did they think they were voting for when they joined the European Union? They were hoping that the gradual handing out of pan-European voting rights on their wallets would lead to anything else but their wallets being voted southwards, towards the electoral heavyweights of Spain France and Italy? Were they that delusional that they thought their eighty million voters could resist the pan-European electoral supermajority of the one hundred seventy million voters of the south? Did they think they were joining a union where the vote of the German citizen would ultimately count more than the vote of the Spaniard, French, or Italian? Delusional indeed. I think those who want more economic freedom and less government spending need to up their game. I’m referring to the debt/GDP measure which is constantly spouted as the best indicator of a government in trouble. But is it really the best when Japan tops the world league table, and Venezuela with a debt/GDP ratio of around 30% is something like the 5th bottom in all of the Americas although the data will be dodgy for that country? 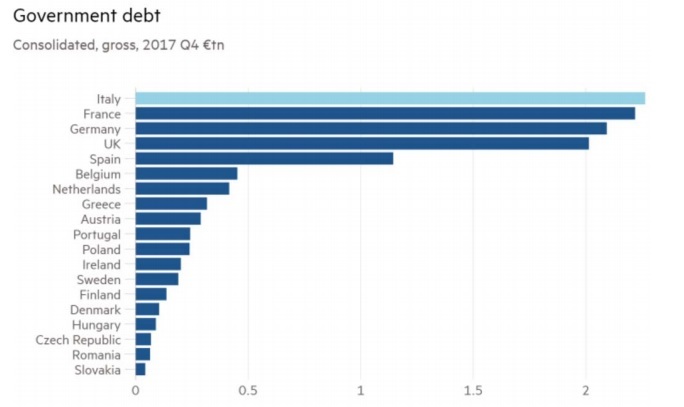 If we use the ratio of General Government External Debt / Exports then Italy drops to 9h in Europe ( after Greece, Cyprus, France, Portugal, Armenia, Spain, UK and Finland ). I think that is a better although not perfect measure of how bad your debt problems are.